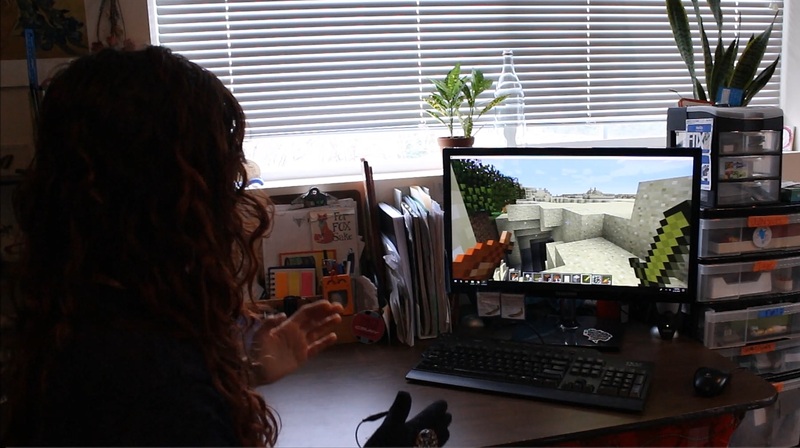 This tutorial will show you how to make your very own gesture game controller for Minecraft (or your other fav. computer game). Move your hand(s) to walk/run/jump, look around, and attack* all the things! 4. Use an alligator clip or insulated wire to connect the CPX ground (“GND”) to the thumb pad. 5. Stitch conductive thread from the CPX capacitive touch pads (A1, A2, A3 & A4) to each of the four fingers. 6. If you have a multimeter, check continuity between the CPX pins and the conductive thread pads. 1. Determine (crucial) game controls. 2. Decide how you want to use gestures and/or the finger pads to trigger these controls. Recommended to sketch out your plan. I’ve always wanted to feel like I was actually *in* a game, so I went the “cheap VR” route and used gestures to control basic movements. For walking, I went the “let’s move my arms like I’m walking” route, which easily transitioned into running and jumping by increasing the speed of motion. To make it easy to place a block or exchange items, I decided to use an “awkward handshake” motion. Let’s get programming: Set up the CPX! 1. If you’re using Windows, download the Adafruit Windows Drivers here. 2. Download & save the latest CPX Circuit Python UF2 file. 3. Plug in the CPX with a USB cable (make sure it has data transfer capabilities). 4. Double-click the reset button on the CPX. The LEDs should turn green. If they are red, it means something is wrong with data transfer to the CPX — check the USB cable, try another USB port on your computer, or try the trusty “unplug and plug back in” method. 5. On your computer, you will see a new disk drive called “CPLAYBOOT”. 6. Drag the CPX Circuit Python UF2 file onto the disk drive. 7. The “CPLAYBOOT” drive will disappear and be replaced with “CIRCUITPY”. Libraries let us access all sorts of special functions for the CPX without having to do a ton of programming.. hooray for open-source! This install will download most of the standard Circuit Python libraries* so peruse them at your leisure to learn about more cool things you can do! 1. Download and save the Adafruit Circuit Python Library Bundle Release from here. 2. Unzip the folder, open the first folder, and copy the “lib” folder onto the “CIRCUITPY” drive. *It is unlikely that you’ll run out of space since the CPX comes with at least 2MB of Flash storage. But, if you do end up needing more space, you can revisit the libraries and remove the ones you don’t need. If you mess ’em up, just copy and paste the lib folder again. The CPX has an on-board compiler, which means you can program it in (pretty much) any language you want! I opted for MicroPython, a version of Python for microcontrollers, ’cause Python is awesome. Read this step if you want to understand how the program works (definitely suggested) or if you want to modify the code. Here’s the GitHub repository that has the full code.Download it, drag it to your CPX, and rename the file “Code.py” (here’s the raw code if you want to just copy & paste). 2. Configure and initialize the libraries. 3. Write short functions for each of the controls. The motion controls can be tricky. Do some initial testing with the accelerometer by printing the values in a serial monitor (in the source code, go to the __main__ function and uncomment the two debugging lines). This will help you to determine thresholds for walking, running and jumping, looking left and right, and placing objects. The touch pad triggers are much easier as you are only looking for a capacitive trigger (True/False). Remember to release all of the keyboard and mouse keys at the end of each function! If you’re familiar with Arduino, you’re probably familiar with the Serial Monitor. The CPX has the same feature with a slightly different access point depending on what program you are using. If you are using Mu it’s super easy: the serial console is built in and will automatically detect your board, yay!. 2. Go to Windows Device Manager and check the serial port number for the CPX (e.g. COM18) — see Photo below. If there are multiple serial ports listed, unplug the CPX and plug it back in to see which one disappears then reappears. 3. Open PuTTY and select “Serial”. 4. Enter the serial port number (e.g. COM18) under “Serial line” and the baud rate of 115200 under “Speed”. *PuTTY is a free and open-source SSH and telnet connection program. Like pretty much every project, this one will likely be a little wonky when you first get it running. If the touch pads are acting strange, reset the CPX (this recalibrates the capacitive input pins). – Test each of the movement controls (you’ll see the mouse moving on the screen and make sure the program doesn’t crash as well as the touch pads (which should display relevant text on the serial monitor). Update the program based on your testing. Remember, it’s OK if it’s not perfect, there’s always time to make it better! You’re ready to run through Minecraft!! Just be wary of monsters, it might be a bit tricky to protect yourself.. Please like and/or leave a comment if you enjoyed the tutorial! And of course, let me know if you have any comments or questions! ← Turn your Pi into a (local) Cloud Server! Thank you! Please let us know if there is anything you’d like to see!